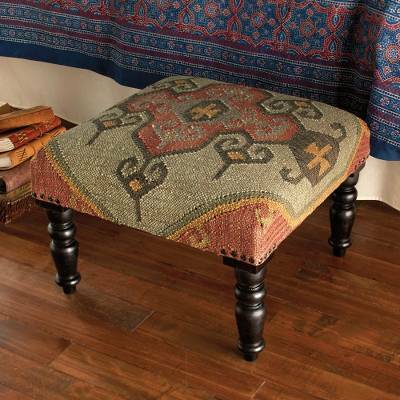 Inspired by traditional Persian designs, this Indian ottoman features handwoven fibers of jute and wool, given abstract geometric patterns after the style of traditional kilim rugs. Typically used for prayer rugs or simple decor, kilim motifs are realized with elegance in this piece of furniture. A frame and legs of rich mango wood complete the ottoman.